To manage agents in your Office account, click Users in the main menu, Agents in the submenu, and Manage in the drop-down menu. Here, you will see all of your agents listed in a table. You can Sort your table by clicking any of the blue headings. You can also Search for a particular agent by using the Search box above the top right corner of the table. Delete agents by checking the boxes to the left of their names, and clicking the Delete Agents link at the bottom of the screen. 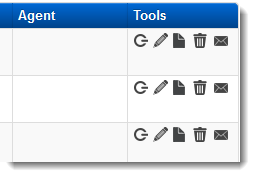 Use the items in the Tools column to further manage leads. Below is a description of what each icon does. Click the Power icon to log in as the agent. Here, you will be able to see the agent's control panel as they would see it when they log in. Click the Edit icon to edit the agent. Change contact information, add a photo, etc. Use the Bio icon to edit this agent's bio page information. Click the Contact icon to email the agent with their login information for their agent-level control panel.